Ships today if you order in the next 6 hours 34 minutes. 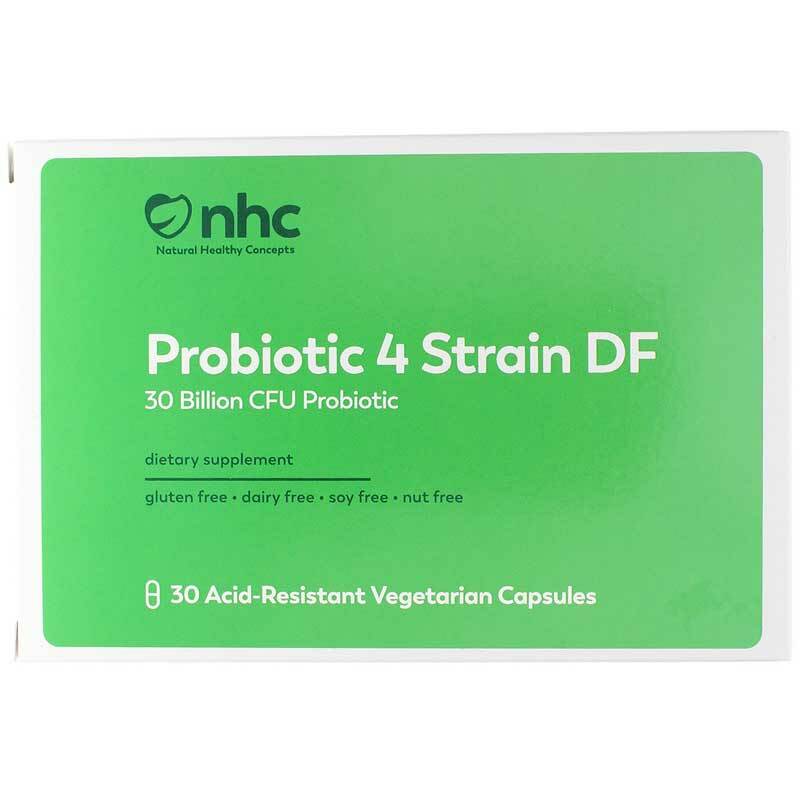 Probiotic 4 Strain DF from Natural Healthy Concepts is a vegetarian probiotic supplement containing four strains of live microorganisms (“good” bacteria) for digestive support. Live bacteria is naturally found in the human body, but there’s a difference between the “good” bacteria (which may help promote healthy digestion) and the “bad” bacteria we usually hear about that can make us ill. To counterbalance any potential harmful bacteria in the body, “good” bacteria, such as probiotics, may help keep the gut healthy. Some yogurts include probiotics, but you still may need to supplement your nutrition with a probiotic. Helping to clear sludge and decaying food build-up from your body is one of the potential benefits of regular probiotic supplement use, which may promote overall health and regularity. Each capsule of Probiotic 4 Strain DF contains a blend of four beneficial bacteria totaling 30 billion CFU per vegetable capsule, including: Lactobacillus acidophilus, Bifidobacterium longum, Lactobacillus plantarum and Bifidobacterium lactis. Packaged in gastro-resistant, extended time-release capsules, the formula aims for targeted release slowly, which may result in better potential benefits. Probiotic 4 Strain DF is free of common allergens, such as wheat, soy, dairy, fish, nuts, eggs and more. It is also free of any GMOs or artificial ingredients. If you need additional “good” bacteria to maintain the balance in your digestive system, try Probiotic 4 Strain DF today! Other Ingredients: microcrystalline cellulose, HPMC (acid-resistant capsule), stearic acid, magnesium stearate and silica. 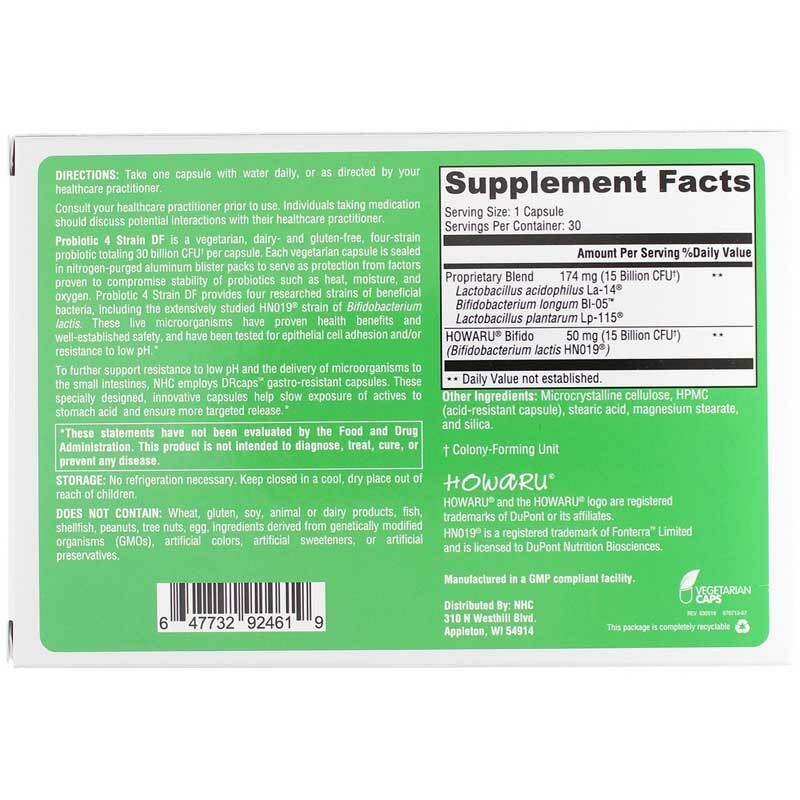 Contains NO: wheat, gluten, soy, soy, animal or dairy products, fish, shellfish, peanuts, tree nuts, egg, ingredients derived from genetically modified organisms (GMOs), artificial colors, artificial sweeteners, or preservatives. Adults: Take one capsule with water daily or as recommended by a healthcare professional. So happy I found your brand! I love that this probiotic is in a blister pack for freshness and that it doesn't require refrigeration! Makes it super easy to travel with them this way also. I just cut off as many as I need. Within a week of starting these, I noticed a difference in my regularity as well. This probiotic works great for me!